We have no shelter, and rely totally on foster homes to house rescued cats. Our adoption program provides local cat lovers with healthy spayed or neutered pets. We make it a priority to take in pregnant moms, who tend to be in most need, and provide them with foster care. 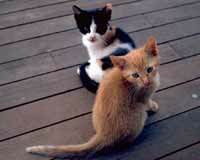 Before the mother or kittens are adopted out, we make sure all are spayed or neutered. The cats in our program are adopted into loving homes. We do not "euthanize" the cats in our care if they are healthy and adoptable. Please spay or neuter your pets, so that incidences of unwanted cats are lessened, it is a loving act toward your cat, and toward future generations. 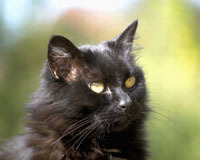 The Victoria Cat Rescue Corps Society was founded in the late 1960s. To learn more about our history, click here. Victoria Animal Control Services may have cats for adoption.